Ramblings of an Impatient Artist: Dare to be Sassy - at the Derby! Dare to be Sassy - at the Derby! It's Dare To Be Sassy Thursday with Sassy Studio Designs! Our challenge this week is the Kentucky Derby - I can't believe it's that time already. Seems like only yesterday it was winter...oh wait! It was! LOL! Now that it's finally warming up, I'm ready for the nice weather and all the things that go with it - even the allergies. One day I'd love to go to the "Run for the Roses", it's not that far from me. I make it a point to watch every year. I love to see all the fabulous hats. Besides, isn't that what it's all about? 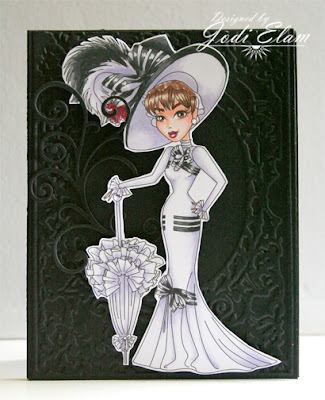 I used My Fair Lady for my image - when I saw the theme she was the perfect pick. All I could think of was Eliza watching the race at Ascot telling Dover to "move his blooming arse!". I colored her with Copics and decided that the white of the dress should have BV (blue-violet) shadows. This was one of my favorite outfits from the movie too so win-win! Now it's your turn to play along with us! Create a Kentucky Derby themed project -bonus points for using Sassy Designs. Make sure you add your link to the blog post and you could win! Gorgeous!!! I didn't even think of this image, she is perfection! Love your coloring as always! Stunning card Jodi - this is probably one of my favourite images. Jodi, this is stunning! Love the dry embossing. So pretty, thanks for playing @ CTO! Very elegant and sophisticated card, love the combination of black and white. Thank you for joining us at the Celebrate the Occasion challenge and hope to see you back again. Lovely card!!! Thanks for joining us at CTO this week!! !